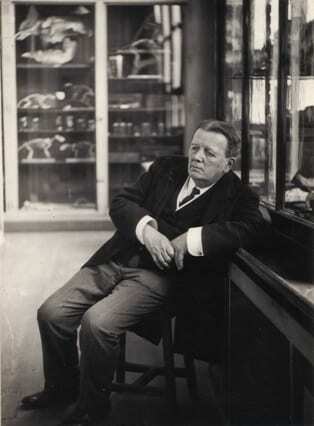 In his role as Professor of Zoology and Comparative Anatomy at UCL from 1875-1890, E. Ray Lankester was responsible for the collection which we now call the Grant Museum of Zoology. Lankester was an extremely influential figure in evolutionary biology, and after UCL went on to a professorship at Oxford and then to direct the Natural History Museum. Something else that people like to say about him is that he was described as having “a head like a benevolent biscuit tin”. When you visit the Grant Museum today you’ll see his influence all over the place – he put together the first formal cataloguing system (though his catalogue is a bit confusing as it includes labels for specimens he wanted to acquire as well as things that actually existed, and there is no way of telling which is which). Although he brought so many specimens into the Museum (including the famous Blaschka glass models), his most famous specimens are of the horseshoe crabs. He used the dissected specimen on display to demonstrate that they were related to arachnids, rather than crabs.